Ryan (12) celebrates his championship with his teammates. 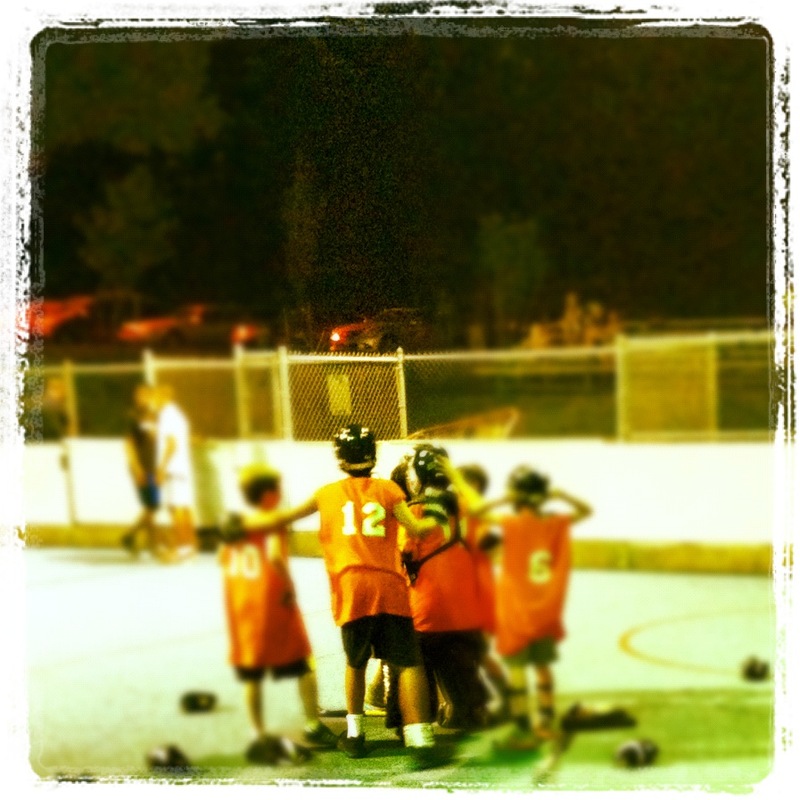 In his first three seasons playing street hockey in our town league, Ryan’s teams won a combined three games. Last night, his team won the championship, coming from behind in the third period of the final game to take home the trophy. But to Ryan, it’s as good as a Stanley Cup. (OK, maybe not quite *that* good. But close). He was engaged throughout. He played hard. He was a good teammate. He was aggressive on the puck. He didn’t complain when taken out of games. He cheered from the bench. He checked on other players when they got hurt. He listened to his coach’s strategy talks (and there was a lot of strategy — I think the coach wanted this more than Ryan did). When his team got a large lead, he minded the coach’s suggestion to tone down the celebrations and work on passing and not shooting. He even scored a goal — just his second in four seasons. He’s a defensive defenseman. Just like his old man. And I couldn’t be prouder. Ryan’s progress as measured through the lens of team sports participation is incredible. The first street hockey season was bumpy. When his team fell behind, he’d cry on the bench. He’d complain when taken out of games. Worse, if his team gave up a goal while on the bench, he’d mutter, loud enough for everyone to hear, that the goal wouldn’t have happened if he was in the game. He was oblivious that he was the worst player on the team. He would lose focus in games and let players go right around him. Veronica and I spent a lot of time shuttling from the bleachers to the bench to intervene with challenging behaviors. Three years later, he is a different child. A part of the team in every sense of the word. A valuable contributor when in the game and a supportive teammate from the bench. Yes, he’s also the kid that informed his goalie of his save percentage as soon as the game ended. Presumably he counted shots on goal and calculated it while playing in the game. I wouldn’t doubt the accuracy of his numbers. He told his coach who the three stars of the game should be. I have said it many times in this space, and I will probably say it many more. Participation in team sports has been nothing but a positive for our child. It is good for his coördination and fitness, sure, but the social benefits are just as important. He’s had to learn how to think like a good teammate. He’s learned to keep his emotions in check while handling the disappointment of losing. He’s learned that if he’s not engaged in the game, he won’t get to play as much. He’s been challenged to keep up with the social banter in the locker room. Again, these are our experiences with our child. As always, your mileage may vary. I would never suggest our path is the correct one for anyone but us (and believe me, we still doubt plenty the choices we make). But if you have a special-needs child you think might benefit from or has an interest in sports, I encourage you to give it a try. I would suggest having “the talk” with the coach — but again, that is a matter of personal preference. I’m also happy to discuss team sports in a less-public forum — my email address is in the right rail of the site. I suppose there is one downside to Ryan’s participation on the team. He may be taking this whole “champion” thing a bit too far. This morning, he and Riley were fighting over what to watch on TV. He refused to compromise, believing that because “I’m a champion” he can do whatever he pleases. I can assure you we snuffed out that flame real quick — but I love that he is so enthusiastic about his accomplishment. I know I am one proud dad. very awesome that you found what seems to be the perfect environment for his growth and self-esteem. as parents, we’re so hard on ourselves when we misstep. celebrating the good push towards independence is always deserved. you should be terribly proud that you were able to show him and share in such a healthy outlet. Thank you so much. Thankfully, I haven’t heard “I’m a champion” again. I know this experience has been good for him, but it’s also been good for us. That first year, I used to watch the games with a terrible pit in my stomach. To see his progress is truly a liberating feeling. How exciting for your champion! It has been a joy to watch this unfold as a bystander. The connection, the social growth, the teamwork…all of it is important for any child, but means so much to those who really work hard. Ryan is a champion on so many levels this summer. Congrats! Thank you. One of things I find so humbling about blogging is the idea that otherwise complete strangers are following along in the everyday activities of my family. It makes me feel connected to such a larger community. If I know my son, a day with the cup would be spent watching, playing, studying hockey. Oh, and then eating a gigantic bowl of plain vanilla ice cream out of it.